Is a new active treatment wrap that combines advanced BIO-technology with natural ingredients that work effectively to dramatically decrease the appearance of fat deposits and cellulite by 67% in less than four weeks. Targeting cellulite and fat, it burns calories, enhances weight loss and slims, firms and tones producing instantly visible and long lasting results from the first treatment. BIOSLIMMING uses high concentrations of active ingredients - essential oils, algae, caffeine, thermo agents - both hot and cold, which is revolutionary. 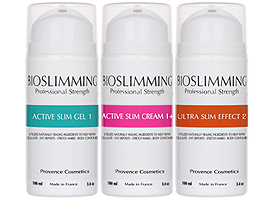 The products are massaged onto the problem area and work in synergy to produce a thermo reaction, which in turn results in Lipolysis - fat burning below the skin. In addition, the lymphatic system is stimulated and the released toxins are transported and eliminated naturally from the body. 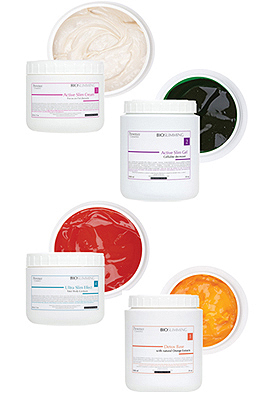 The treatment consists of three gels and a cream, which are applied in a two stage process. The first stage consists of Detox Base, Ultra Slim Gel and Ultra Slim Cream, which are massaged into the targeted areas. The treated areas are then covered with bio-film and a 40 minute period of relaxation follows. The second stage consists of the bio-film being removed and the Ultra Slim Effect being massaged vigorously into the treated areas, after which there is another 10 minutes of relaxation. There is no compression or manipulation of the tissues; the results are achieved due to the active ingredients contained within the products acting upon the tissue. In clinical trials 98% of women saw dramatic improvement of "orange peel" skin, with a reduction of cellulite in just two weeks. 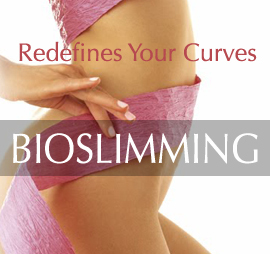 100% of women observed a decrease of 1 to 4 cm around their waist. For optimum results, your Aesthetician will advise a course of six treatments, four to seven days apart combined with a homecare program which is simple, effective and easy to use. One week's use of the homecare products is equivalent to one in-house treatment. If the products are applied before a workout this further enhances the effectiveness of them.